Redemptorist Father Dennis Demko, who served for two decades in Puerto Rico, died Dec. 30, 2009, as a member of the St. John Neumann community at Stella Maris in Timonium, MD. Father Demko was 57 years old and had been suffering with Parkinson’s and Alzheimer’s diseases; the immediate cause of his death was double pneumonia. The only child of Joseph and Mary Janega Demko, he was born on July 28, 1952. He studied at the Redemptorist St. Mary’s Seminary in North East, PA, and made his novitiate in Oconomowoc, WI. 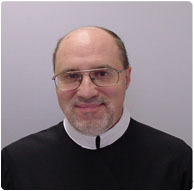 He made his first profession of vows in 1974 and his perpetual vows in 1977. Father Demko earned a B.A. in Philosophy from St. Alphonsus College in Suffield, CT; a Master’s degree in Religious Education and a Master’s degree in Divinity from Mount St. Alphonsus in Esopus, NY. He was ordained to the priesthood on May 24, 1980, in Esopus. During his seminary years, confreres learned that Father Demko was an all-round athlete. Father Dennis Billy, a classmate, described him as “the epitome of the typical North East, Redemptorist jock.” He played baseball, football, basketball and hockey. Father Denis Sweeney remembered his fellow seminarian as shooting 100 baskets a day on his off day — just to keep in practice. Not long afterwards, “Padre Dennis” returned to the rectory from his mission church with a huge smile on his face, Father Moley said. The congregation had surprised their young priest with a party for his birthday. After serving in Guayama from 1981 to 1990, Father Demko was named rector of Los Tres Santos Reyes in Aguas Buenas, a position he held for two three-year terms. During that same period, he also served on the Provincial Chapter. In 1996, he was named superior of the Nuestra Sra. de Las Mercedes community in San Lorenzo. Several of the confreres mentioned this aspect of Father Demko, noting that he loved reading Thomas Merton and that he was consistent in fasting every Friday. Father Demko returned to the Baltimore Province in 2002, concerned over the failing health of both of his parents and, as their only child, wanting to do everything he could to ensure their care. He was assigned to St. Peter the Apostle Church in Philadelphia, where, once again, Father Moley became his rector. “Father Dennis would go 70 miles to get milk for his father,” Father Moley said, because Mr. Demko wanted a certain brand of milk that he remembered from his childhood. While seeing his parents’ suffering with forms of dementia and experiencing his father’s death, Father Demko was diagnosed with brain lesions, a prelude of his own physical and mental decline. In 2005, Father Demko was assigned to St. John Neumann Residence in Saratoga Springs, NY, and when the Residence was relocated to Stella Maris in Timonium, MD, Father Demko was among those escorted to the Redemptorist wing of the nursing home. In addition to his mother, Father Demko is survived by three aunts, Dorothy Skulskie, Steph Demko and Anna Pogwist; his cousins Mark and Anne Zerbe, Joan and Ty Zerbe, and Frank Demko; and longtime friends Gene and Kathy Brice. Burial to follow in Redemptorist cemetery.